TemplateHack.com - Download Grace premium blogger template. 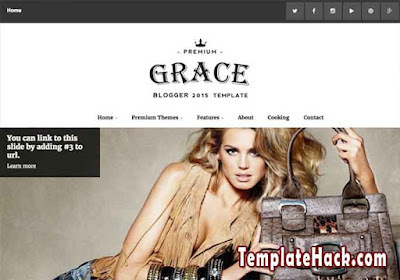 Grace is black fashion blogger template. Not recommended for girly blogger, but you can change the dark color easily by customize on blogger dashboard. You can put maximum 3 photo to slide and adding url on that section. So, you can put your editor pick on featured post manually. It would be great to applied on your magazine blog. Download this premium free blogger template by clicking the download button on the bottom of this page. Breadcrumbs, Browser Compatibility, Customizable, Drop Down Menu, Email Subscription Widget Ready, Fast Loading, Featured Post, HTML5 Valid, Mobile Friendly, Page Navigation Menu, Post Thumbnails, SEO Friendly, Slideshow, Slider, Social Bookmark Ready, Whatsapp Sharing Button, Clean, Elegant, 1 Right Sidebar, black, dark, 2 Columns, 3 Columns Footer. Adapted From Wordpress blogger template, Beauty blogger template, Daily Blog blogger template, Entertainment blogger template, Fashion blogger template, Gallery blogger template, Lifestyle blogger template, Magazine blogger template, OOTD blogger template, Personal blogger template, Photo blogger template, Portal blogger template, Reviews blogger template, Travel blogger template, Viral blogger template.